In 2014, URBED were invited to take part in the Architektursommer Rhein-Main ASRM Lab 2014: Region im Fluss, organised in association with the German Architecture Museum (D.A.M) and Kulturfonds Frankfurt Rhein-Main. This was a multi-disciplinary workshop in Frankfurt looking at some of the region's most problematic and neglected urban and semi-rural spaces, and in doing so explore ‘the regional city’. Over the course of 4 days participants visited several sites, discussing the constraints and issues facing each area with local practices and planners, and collaboratively exploring initial ideas and approaches. The subsequent ASRM Expo 2015 Region im Fluss exhibition at the German Architecture Museum (D.A.M) gave URBED an opportunity to present ideas for the region based on our central theme: cities growing together. It also gave us an opportunity to focus the discourse on Offenbach, a vibrant but often neglected part of the Frankfurt conurbation on the southern bank of the River Main. These events culminated in November 2015 in the ARSM Future Pavilion situated in the Goetheplatz in the centre of Frankfurt. The pavilion, initially designed by URBED, formed a public forum for discussion and debate around urban and regional development. URBED took a week-long residency within the pavilion following its inauguration, running a participative public exhibition to highlight the significance of Offenbach as a building-block of the creative city. To stimulate discussion and debate we built a scale model of the Frankfurt conurbation with the public over a number of days, and exhibited the attached drawings of Offenbach and the Northern Quarter in Manchester, the latter having some similarities as a cultural quarter. For a video of the exhibiton you can follow this link. For more discussion around Offenbach you can read David Rudlin’s post The Offenbach Block on the Climax City blog. 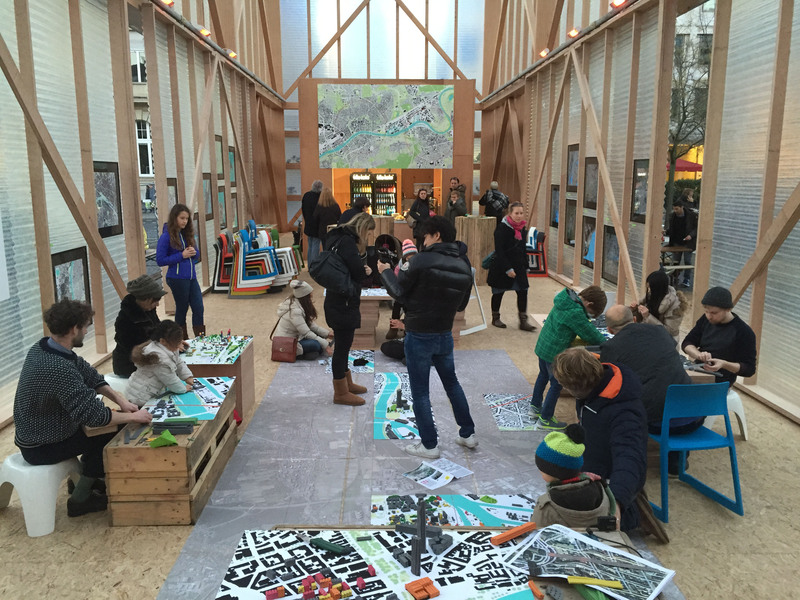 In November 2015, URBED took a week-long residency in the ASRM Future Pavilion in the centre of Frankfurt, where we ran a participative public exhibition to stimulate discussion and debate around the future of the city and it's neighbourhoods. To stimulate this discussion we built a scale model of the Frankfurt conurbation with members of the public over a number of days. In particular, we wanted to highlight the significance of the often-neglected Offenbach as a building-block of the creative city, and in doing so draw parallels to the creative economy of our own Northern Quarter in Manchester. For a video of the exhibiton please follow this link. Members of the public join the build, whilst often modelling and discussing their own neighbourhoods. The URBED team, Frankfurt model, and a pile of plasticine, after three days of modelling. The model continued to grow several days after the URBED team had travelled back to the UK. The Future Pavilion was created for the Architektursommer Rhein-Main 2015 to act as public forum for discussion and debate around urban and regional development. It is situated in Goetheplatz in central Frankfurt, and will host a year-long program of workshops, classes, and events, beginning with a week-long participatory public exhibition by URBED. The pavilion is a temporary structure, designed to be dismantled at the end of the program of events and reused elsewhere in the future. URBED worked on the initial concept design of the pavilion, as shown in the image below, before it was further developed and delivered by Ian Shaw Architekten in Frankfurt. The launch of the ASRM exhibition at the German Architecture Museum (D.A.M) included short presentations of the ideas for the region from the workshop participants. Our ideas are summerised on the attached PDFs. URBED took part in a 4 day workshop as part of the Architektur Sommer: Rhein-Main. The workshop ran over 4 days with participants visiting sites, discussing with local practices and planners from the different regions the constraints and issues facing each area, working together on ideas and culminated in a presentation of initial ideas. The ideas generated from the workshop will be exhibited at D.A.M - and at the opening, on May 20th 2014, we will present our ideas for the region and propose a smaller scale intervention to communicate these ideas. ASRM Lab 2014: Region im Fluss represents Part I of the programme. Part II, ASRM Expo 2015: Region im Fluss, is scheduled for July-Sept 2015. This will comprise a series of temporary art/architecture interventions that will respond to the findings of the workshop, animating and disseminating our central theme: cities growing together.